me and him: All the sudden we live in Texas... ! All the sudden we live in Texas... ! And so our great Texas Hill Country adventure begins! Y'all. All y'all. 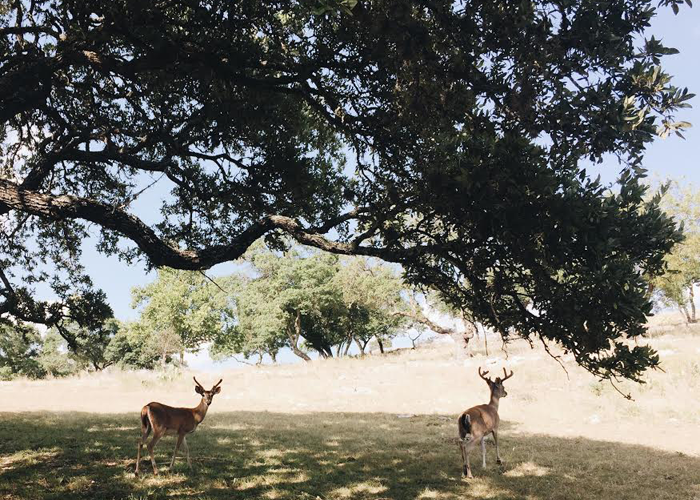 If we wanted to get all technical, our great Texas Hill Country adventure began in July. But I'm not certain we really wanted to get all technical, and I wouldn't continue to be me if I did any sort of blogging on schedule. Already we've met a giant tarantula, who's name is Terrance, who lives somewhere in our front yard. We've come to an understanding—he eats all the scorpions, he doesn't jump on us, we keep face to face time at a bare minimum, and he can stay. Maybe. We've named several of the neighborhood deer. And have heard true tale of the deer/goat who roams one hill-top neighborhood over—my personal search for this mystical creature continues. We are lucky enough to find ourselves working with lovely people and have made some great friends. We've stumbled into free gym memberships at the same fitness center Thomas Haden Church (yeah... I wasn't sure exactly who that was either) has frequented, spotted exercising in his gym–shorts and cowboy boots. Jas and I have both gone once. And no famous people sitings. We've got finger–lickin barbecue/brisket up the road a ways and have been introduced to the breakfast taco and Rita makes em upright here in downtown Kerrville. And! We are proud first-time-owners of an actual landline. It is the only way to carry on a full phone conversation as cell service is super spotty where we currently reside, unless you happen to be calling on a particularly cloudy day. Toto, I've a feeling we're not in California anymore. Not to make us sound overly Pure Country, we're totally big city here, we have a 'Penny's. You're so awesome, congrats on your new adventure! I've been following for awhile and you two never cease to astound me. Love it! I am ready to come, except we are still 17 hours away... Miss you two! And this is Ashley, not Jordan. So glad to see you on here again! I'm not sure I could stand Terrance...I've never thought about naming our bats...that I'm not sure why we let them stay. eeks. Pretty awesome about Penney's though!